As the Kathin Tean season is coming, the Chhaiyam bands are playing their music with their drums, chanting “Naughty old man! Naughty old man! The older they become, the naughtier they get!” This is a very funny Khmer chant, used to mock the married men who have affairs despite their old age. During and briefly after the war, people prioritized their hunger. All they cared about was food and their survival. Today, on the contrary, many of them have a strong demand to satisfy their sexual desires. Obviously, some men and women, though married, are looking for an affair while some others’ behavior if they love someone and then that person don’t love, he/she do not allow the others to love that person too. 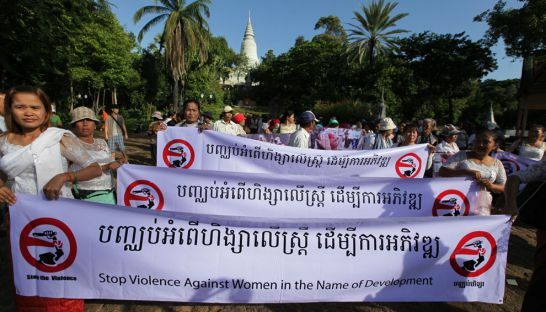 Lust and desire are the main factors that cause gender-based violence in Cambodian society. From the morning news from your radios and TVs or local newspapers, you may notice the cases of gender-based violence alongside those of traffic accidents and murders. The news from such sources is allegedly exaggerated, and thus cannot be trusted. Although the prevention of domestic violence seems to have improved, as the number of the female victims has fallen from one-fourth to one-fifth (CDHS, 2005 & MOWA, 2009), there have been several incredibly horrible cases recently. For example, a few weeks recently, a major general, two stars, was convicted with murder of his 27-year-old mistress and 6-year-old daughter. The reason, as the murderer stated, because he was jealous with his mistress having an affair with a foreign man, whom she had known via Facebook, and she asked to separate. Similar cases have also occurred all over the country. In Prey Veng, a man stabbed his ex-wife, killing her, as with a pointy knife which was result of jealousy, barely a few months after their divorce and his request to get back together. Jealousy also caused a drunken man in Kampong Chhang to beat his wife with a pestle, almost taking her life. Another young man in Kampong Cham decided to kill his girlfriend before committing suicide after learning that she would marry another man. “The offenders of these cases are being prosecuted or hunted down. The main reason for such tragedies is, of course, lust or sexual desire. Obviously, it has the power to turn anyone, whether he or she is a scholar or uneducated, a rich or a poor person, a politician or a lawmaker, into cold-blood killer. In the police’s annual report on nationwide crimes, no single phrase analyses the rate of gender-based violence, nor is there any clue about its trends of occurrences and causes. In terms of law, monogamy is mandated by the constitutional law and two more laws more against domestic violence and and adultery exist. However, these are easily ignored; their effectiveness has not been proven. Surprisingly, the adultery law has only been applied on Prince Norodom Ranariddh and Mr. Khek Ravy, the former Secretary of States of the Ministry of Commerce and the former President of Football Federation of Cambodia. The depiction of gender-based violence in the news resembles that in the films or karaoke. For instance, the karaoke video of, “Don’t Love Him More than Me” by singer Khem clearly depicts the impact of jealousy and illegal arm use. First, the male protagonist intends to kill a man with a gun, and next, he is killed by the female protagonist’s ex-boyfriend in her wedding, causing chaos and shock to the wedding guests. In some ways, gender-based violence is caused when a father or stepfather has an affair with or rapes the daughter, arousing his wife’s jealousy and undoubtedly leading to violence. Meanwhile, most cases of violence occur when a married man has an affair, creating feuding and conflict between his wife and the other woman. Sometimes, the wife goes to the affair’s house to settle this issue by violent means, cursing at her or even worse, committing homicide. Alcohol could also be a catalyst of such behavior. The Ministry of Women’s Affairs and their development partners have participated in a wide range of efforts such as the establishment of laws, policies, guidelines and research. Nevertheless, since the related documents are mostly in English, most officials and personnel barely understand them. Accordingly, the documents should be translated into Khmer. Some of budget allotted for creating documents should be diverted to sponsoring gender-based violence prevention through (i) the dissemination of this information by the media; (ii) the education of high-ranking officials about this issue by the gender focal points who work in or directly with public institutions; and (iii) educating communities through national policy on sub-national development (D&D), especially at the district and communal council levels as they work closely with the citizens. Authorities need to stop using negotiations as a recourse, or being ignorant about the severity of gender-based violence. In serious cases where there is no resolution and/or violence is involved, the authorities should file the case to court for prosecution or divorce. The victims, who can no longer bear living in such terrible circumstances and a meaningless life, can often prefer divorce. In the United States, divorce is now an ordinary aspect of married life, as about 50 percent of married couples have divorced or separated. With respect to peer relations, young people should help their friends with their relationship problems in order to prevent them from committing suicide or becoming murderous. And finally, when will an alcohol-control law be adopted?